There are about eight species of Flashlight Fish thinly spread across half a dozen genera in the Anomalopidae family, and they can be found throughout the tropics. They belong to the same family as the ghoulish Fangtooth, but are far better dressed and altogether more pleasant than that grisly gremlin with its fangs and... tooth. 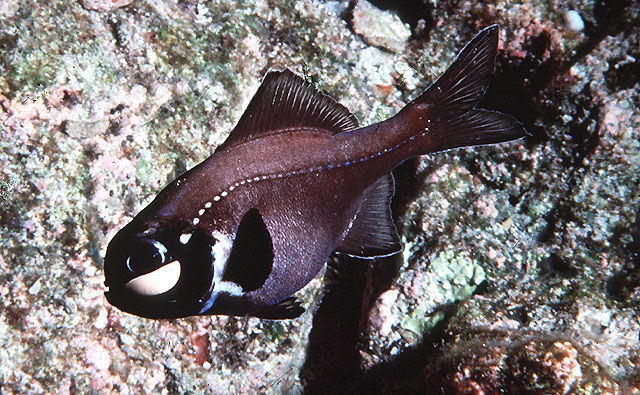 Flashlight Fish are almost entirely black, with a beautiful, glossy sheen that makes me want to run my hands down their sleek, shiny bodies and blush and say "but it could never work between us... could it?" A boy and his fish. It's a love that dare not speak its name. It probably doesn't even have a name. This is cutting-edge love on the very frontier of romance. But I'll save all that for my memoirs. 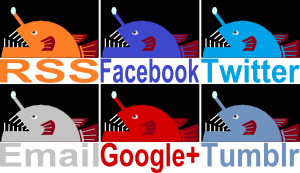 These fish are small; one reaches around 30 cm (a foot) long, while most of the rest are more or less 10 cm (4 in) in length. For such a little fish, they make a lot of light. 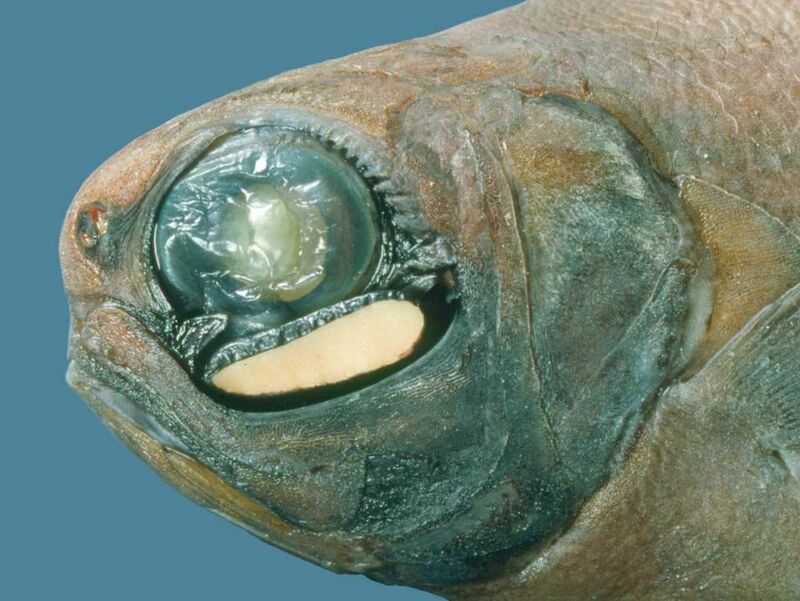 Beneath each eye is a large organ packed full of luminescent bacteria. They look incredibly spooky in the dark as this active fish darts around in search of small creatures to eat. 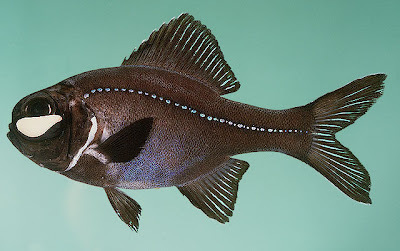 The bacteria never stop producing light, so the only way for the fish to turn it off is to cover it with a kind of black eyelid or rotate it into a pouch beneath the organ. Thank goodness for "off" switches! With their huge eye lights and prominent lateral line, that line of sensitive scales along the body that detects movement in the water, you might think that Flashlight Fish live in extraordinary depths where almost everything is Giant and gelatinous. The truth is, they don't particularly. A few species spend the day as deep as 400 metres (1,300 ft), but most hide in reef and rock crevices at more modest depths while the sun is up. They emerge in the night, swimming out and up to feeding grounds closer to the water's surface. Here, they use their flashlights to attract prey, confuse predators or communicate with their friends. They can put on quite a show when a crowd gathers together to feed and hang out. It's like a "bring your own light" disco. Young'uns these days WISH they could glow in the dark like this! Ha! I think it's a beautiful story. It'd make a wonderful movie!